SuperPhillip Central has hit another review milestone! The site and I are happy to announce that this review is our 650th! As this is a celebratory occasion, I encourage you (as long as you are of age, of course) to take a shot every time you read the words "Monster Hunter" in this review for Final Fantasy Explorers. When your boss or professor asks you why you missed work or class the next day, you can obviously point them to my direction. That's my gift to you, my dear readers! Let there be no pretense here. I will be mentioning Monster Hunter a multitude of times in this review for Final Fantasy Explorers. Square Enix's latest takes the monster-hunting format of Capcom's well regarded and mega-selling series and gives it a Final Fantasy spin. That is by no means a bad thing at all, as there have been many games to ape the Monster Hunter formula to varying degrees of success, such as Soul Sacrifice, Ragnarok Odyssey, Freedom Wars, God Eater, and so forth and so on. Final Fantasy finally takes on the formula with what can be nicely described as a Monster Hunter-lite experience, fresh with grinding for materials to create new armor and weapons, giant creatures to take on, and online lobbies for friends and total strangers to enjoy the thrill of the hunt together. While Final Fantasy Explorers doesn't hit the same highs as Monster Hunter, it does deliver fun and familiar gameplay that should be pleasing to both Final Fantasy and Monster Hunter fans for various reasons. That big sword is obviously trying to make up for something! When you first delve into the world of Final Fantasy Explorers, you are asked to create a custom character. The customization options are a tad light, offering the ability to customize your gender, body color, hair, hair color, face, eye color, voice, etc. These options can be tweaked later in the game. Fortunately, the resolution of your character in-game is so low that what you look like really doesn't matter. It's the crafted armor and weapons that matter more, as they're much easier to see while you're playing. Starting out in Final Fantasy Explorers, you have but a handful of job classes to choose from that you can play as. As you complete special quests, the number opens up considerably. There's everything from traditional knights to mages of the black, white, red, and blue variety; monks, thieves, ninja, and even classes unlocked through specific methods like defeating a specific number of enemies or crafting a certain amount of weapons and armor. The immense amount of job classes available allows such a fantastic number of customization options to suit any player's play style. With a plethora of class-exclusive gear and abilities for each class, the customization becomes even greater and more personal-- at least far more than what the initial character creator offers. 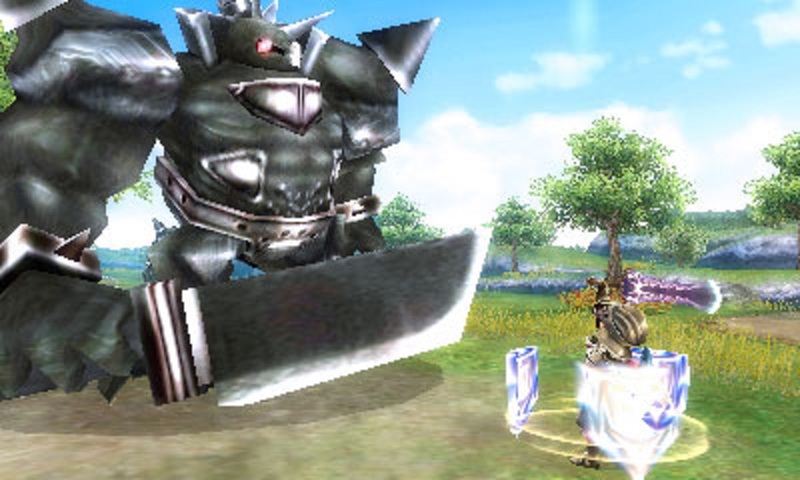 One of many classes within Final Fantasy Explorers. Unlike most Final Fantasy games, however, there is but a weak semblance of a plot to be found in Final Fantasy Explorers. You're one of many explorers, warriors sent to the game's main island to seek out a means to explore the Grand Crystal. This crystal is said to be able to allow kingdoms the world over to thrive, so it's kind of a big deal to reach. 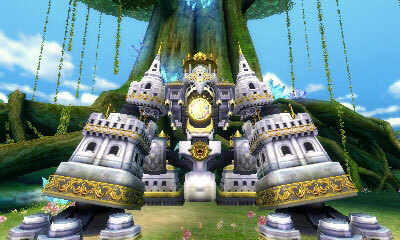 Along the way and between quests, you'll talk with various NPCs in Explorers' main hub, a central town. Here at the town you can do a number of things. Obviously, primo numero uno is to take a look at and accept a numerous amount of ever-expanding quests at the quest counter. There is also a shop which specializes in health and ability point (AP) restoring items to purchase, a synthesis shop where you can trade materials earned from fallen foes, found from gathering spots, and dropped by boss monsters to create new weapons, shields, armor (in head, body, and leg categories to create armor sets), and accessories. Finally, there is a fortune teller in town, as well as a place to craft monsters to aid you in battle in solo mode. These monsters are available to be crafted once they are collected through rare drops of enemies. Like Monster Hunter, Final Fantasy Explorers employs a quest system. Each quest is in one of ten star categories. The more stars there are, the harder the category of quest. You begin with one-star quests that are as simple as picking up 10 items from dropped enemies or just taking down a specific number of foes to get yourself accustomed to combat. Combat itself is a drastic departure from Monster Hunter. Final Fantasy Explorers opts for a more button-mash happy style to its battling, unlike Monster Hunter's more cerebral and highly strategic approach. Still, with Explorers, you can't just expect to mash the attack button all the time and win against the game's more powerful foes, different Eidolons from the Final Fantasy series serving as the game's bosses. Though with weaker enemies, this approach is usually a winning one. 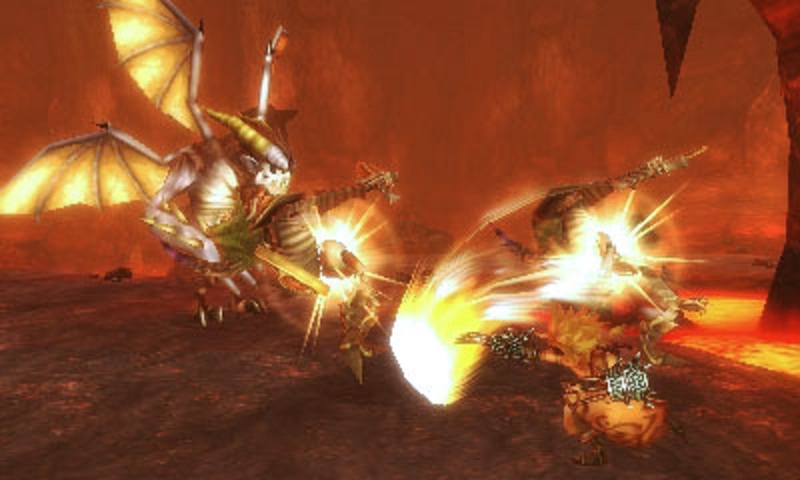 With the Eidolons of Final Fantasy Explorers, the summoned creatures known from other Final Fantasy games, these enemies have a more complicated series of attacks and patterns to them. Most of the time you'll need to pick your times to attack very carefully, or else you'll see your HP dwindle into nothing quite quickly. Common summons from the Final Fantasy series like Ifrit, Shiva, Ramuh, Alexander, Leviathan, Odin, and more are just some of the beasts and creatures you'll find yourself going up against. Alexander may lay about the battlefield, but it's still one tough cookie for those who underestimate it. Thankfully, you're not just limited to your regular attack button for combat. 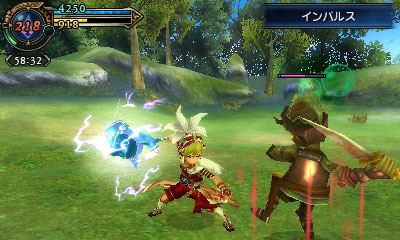 After all, though I've called Final Fantasy Explorers a Monster Hunter-lite like game, it's not THAT basic. By using CP (command points) to purchase new skills, abilities, and spells, you can assign up to eight to use in battle. By holding either the L or R button, you'll get a set of four to choose from to unleash, with each assigned to a different face button. Abilities and spells cost AP to use, as does running in general, and this is restored naturally over a relatively short period of time. You can have monsters join your cause in solo play. 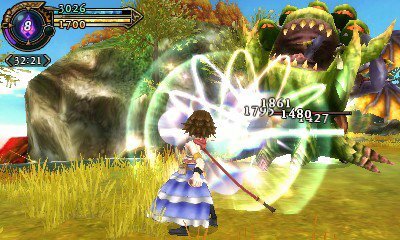 The abilities and magic used have a cool-down period, which is very reminiscent of the Final Fantasy series' ATB (active time battle) system. Explorers feels like an action-RPG version of this very familiar combat system from Final Fantasy games of old. Depending on the ability or spell used, the cool-down amount varies, with more powerful moves taking longer for you to wait before they can be used again. As you fight foes, you'll come across something called the Crystal Surge. When this occurs, you can hold the L and R buttons together and select from one of four temporary bonuses in battle. This can be anything from adding elemental strength or status effects to your attacks and abilities to attacking for and taking damage for 1,000 HP with each hit, a supremely risk vs. reward-type bonus. Additionally, there is a Trance skill that fills up as you play through a given quest. When the crystal icon on the touch screen is full, you can tap it to initiate a trance state. Here, you can use Magicite from Eidolons you've captured from encasing them while their HP is extremely low to summon these foes into battle to let loose powerful attacks. Use Trance to even take the form of some Final Fantasy all-stars. Quests can only be failed through one way, and it's a much less punishing way than Monster Hunter. Each quest has a time limit to it. When you lose all of your HP in battle, you have the choice of being revived by spending five minutes of the quest timer. If you lack five minutes on the timer or the timer hits zero mid-quest, you automatically fail it. Therefore, while it's important to stay alive, you don't have to replay as many quests as you would in Monster Hunter. Really, that's what Final Fantasy Explorers is. It's a much friendlier Monster Hunter. While I wouldn't exactly call it "baby's first Monster Hunter", the game definitely errs on the easier side of this type of game. There's much less grinding of materials to wade through to get the armor set you want, and there's less punishment from missing an attack or not timing your attack correctly (as attacks are pretty much automatic and have no waiting period to unleash them). Because one pair of wings isn't anything to brag about. There is but one map to journey across in Final Fantasy Explorers, and like Monster Hunter's various ones, it is split up between areas and loading screens. The map is quite large, possessing many sub-areas that feature paths to boss areas. A problem with this map structure is incredibly apparent when you're free-roaming the map or having to find and take down more than one Eidolon in a given quest. You see, the sub-areas can have up to three rooms to them before you enter the chamber with the Eidolon. If you aren't finished with the quest, then, after defeating it, you have to go back through the previous rooms just to reach the main map again. Then, you have to run across the barren maps of the game to reach the next series of sub-areas just to meet the next boss to take down. It's a lot of running through sparse areas that makes for a huge slog and pacing killer. That's one of my main problems with Final Fantasy Explorers, actually exploring the map. This coeurl takes this beatdown like a champ. 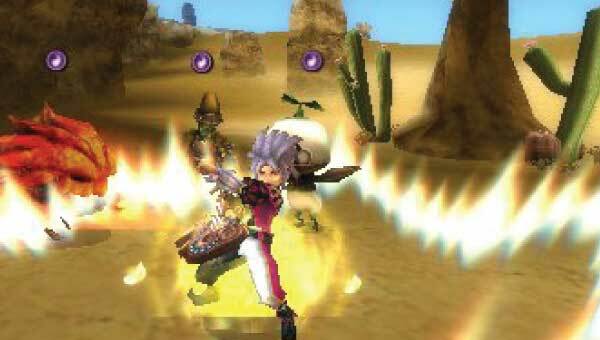 Final Fantasy Explorers' main story arc concludes around the five-star level quests. However, like any good Monster Hunter clone, the fun isn't over after you've beaten the final boss and have viewed the ending credits. Quests can go up to ten stars, with more stars equaling the ability to find rarer drops more easily, and with this comes more difficult challenges: facing two Eidolons at once, fighting foes with special challenges added to them such as double HP and attack strength for all enemies, and a lot more challenging... well.... challenges. What do you do when the game becomes too challenging? If playing alone is too lonely, hop online for some cooperative exploring! 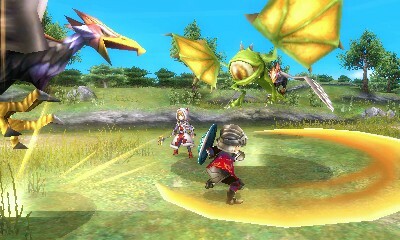 On the presentation side of Final Fantasy Explorers, the visuals don't really impress too much. The most impressive part of the package comes from the character models and creatures, and even then, for the detail involved, there are a lot of jaggies. Plus, the frame-rate isn't very consistent either. Sound-wise, Explorers uses sparse voice acting, only used for welcoming messages when you talk to certain NPCs in the game's central hub. The music is pretty disappointing, not coming anywhere close to being very memorable, unlike the majority of Final Fantasy games in the series, even spin-off-wise. Those looking for a deep, Monster Hunter-like experience might be turned off by the overall simplicity of Final Fantasy Explorers. For me, I think the general ease of combat and more accessible, inviting gameplay and structure make for an enjoyable Monster Hunter clone, regardless. 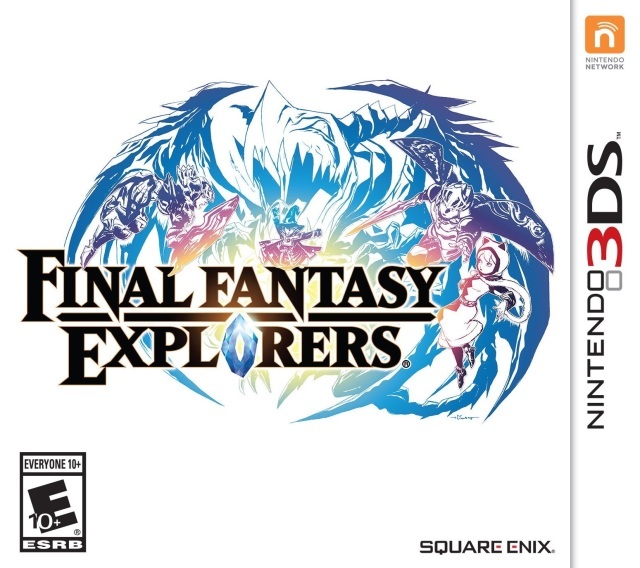 The trudging pace of exploring the game map, and the unfortunate level of quality of the presentation aside, Final Fantasy Explorers is an addicting change of pace for those wanting a different kind of Final Fantasy experience, or just want to stop hunting Rathalos and company for a little while. The Legend of Zelda: Twilight Princess' HD remaster is releasing in less than a month on Wii U. With added amiibo support, GamePad bonuses, and of course everything in glorious high definition. Take a look at the latest trailer for the game, showing off the aforementioned new features that this Wii U remaster will bring to the table. On this fine Tuesday we continue our journey (or should I say "adventure"?) through the world of mobile gaming. This time, we delve into an iOS game that is pretty much a Mega Man rip-off. For its price, the gameplay is quite solid, and the game itself is worth checking out. 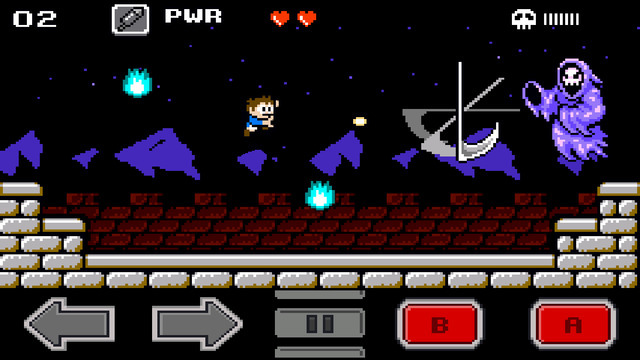 It's Venture Kid for iOS devices, and here's the SuperPhillip Central review. The kid is all right. With Capcom putting Mega Man out to pasture over the years (though the Legacy Collection is seeing a retail release this month, featuring all six NES titles and various extras), many fans have been clamoring for something entirely new from the series. Since Capcom isn't happy to oblige just yet, fans like myself have gone elsewhere to get our fix from a new Mega Man-like game. Many Mega Man styled titles have reached consoles and handhelds, but on iOS and Android, the thirst for a game that plays like the Blue Bomber's own games is indeed real. Thankfully, FDG Entertainment enters the arena with a game that feels like home to a Mega Man fan like yours truly, and that game is Venture Kid. It may feature a generic identity, but the gameplay and price makes for a game that satisfies my craving for more Mega Man-like games in my life. 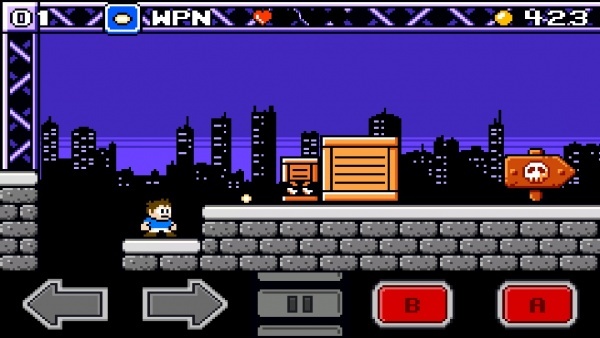 Venture Kid is an admirable attempt at bringing a Mega Man style game to iOS-enabled devices. The touch controls work well enough, but if you're interested in more precision, you can use a controller for added accuracy. Either way you play, you're going to find incredibly tight controls that just feel right and work well. Holding down the jump button for a long duration gives you the largest hang-time in and apex of your jump. There are tricky moments where spikes are on the ceiling, and jumping too high will result in immediate death. Therefore, it's paramount that you just tap the jump button in this case. They look cute, but these enemies have no reservations against taking our hero Andy out. The initial eight stages are relatively challenging to get through, staying true to the Mega Man style. However, in Venture Kid, you play them in order instead of being able to choose which you start with and end with. The levels take place in your traditional settings with little in the way of innovation, such as a forest, a city, a factory, a castle, and a space fortress, for instance. What boss lurks ahead for Andy to defeat? Every level outside of the final two that take place in the big bad's space fortress lair contains a hidden golden treasure to find. These are placed in some really clever locations that require a keen eye to discover. You can use a bomb to blast a cracked wall to enter a secret area, or you can leap onto what seems like the top of a room and walk over the ceiling to a hidden chamber. Most of these treasures aren't too tricky to find, only taking me my first run to figure out their locations, but some require more involved steps, such as hitting a switch to open an otherwise locked door. These treasures are used to keep open doors leading to the true final boss encounter of Venture Kid. Speaking of which, each level in Venture Kid concludes with a boss battle, and these are serviceable enough affairs that have you taking on everything from a tiger that launches furballs at you to a duo of miners on a pushcart, to the grim reaper himself. Bosses have one or two set moves they unleash on you, and when their health bar reaches below halfway, they generally introduce a new hitch to their otherwise predictable attack patterns. Time to serve this grim reaper his just desserts. 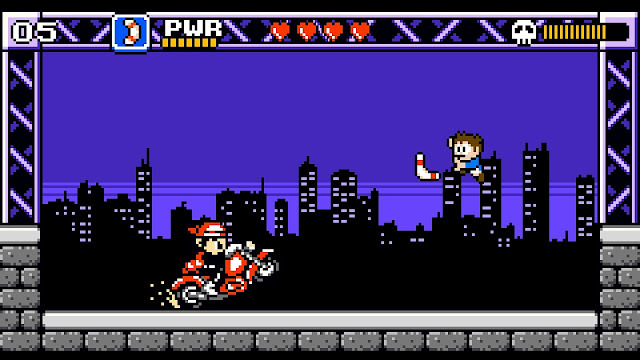 After beating a level, in true Mega Man fashion, you earn a new weapon or item to assist you in the game. Everything from firework rockets that shoot at a diagonal angle, perfect for flying enemies, to items that allow you to double jump or walk on spikes that would otherwise kill you just by touching them. Each item has a set amount of weapon energy to it, so when a weapon is out of juice, you can either utilize a potion that restores energy or collect dropped weapon energy capsules from enemies. Spiders, bees, moles, and any other type of foe you can think of is pitted against Andy. When you're on the world map, you can select any level you've previously completed to seek out alternate paths to the before mentioned hidden treasures or to boost your orb count. Orbs are the currency of Venture Kid, and these go a long way to helping you buy beneficial goodies like extra lives, weapon energy recovery potions, and extra hearts to add to your health supply, to name a few. There are some micro-transactions to be found in Venture Kid, but these are by no means necessary to fully enjoy the game. They just allow you to use real world money to get orbs or in one case the ability to double the amount of orbs you collect. Venture Kid is a game that can be quite short, lasting about an hour or two for persistent players. There are over 40 achievements to earn, ranging from beating levels, using items in particular ways, and beating bosses in quick fashion, without taking damage, and having one heart of health left. A hard difficulty mode adds to the longevity of this 99 cent game, making it very much worth a purchase for anyone who likes Mega Man styled games. Be mindful of those spikes; they're instant death! 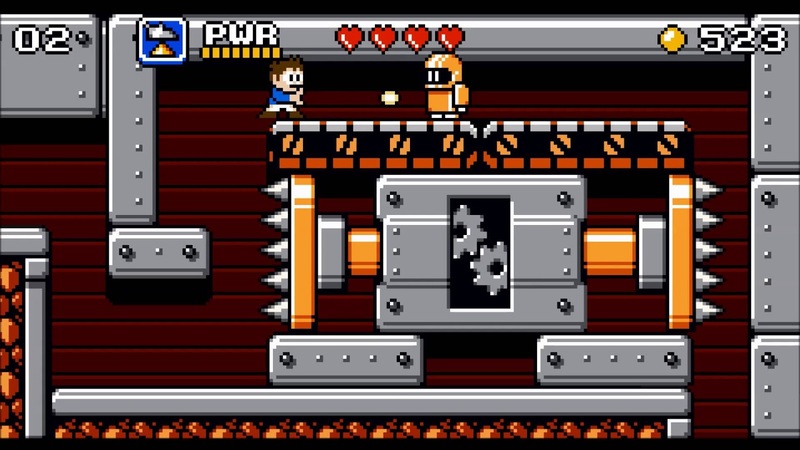 The only real criticism I can place on Venture Kid is that between the initial eight levels and the final two, there is an immense spike in difficulty, having the space fortress levels possess a gross abundance of one-hit kills and "gotcha" moments. What makes matters worse is that to get the true ending of the game, you have to beat a multiple phase boss and chase after it in several auto-scrolling sections. Losing all your lives, which is quite easy due to health-restoring pickups being removed from the level once they've been picked up, results in having to redo the almost hair-pulling-frustrating final level all over again. Be sure to stock up on a lot of lives before taking on this incredibly challenging last level. This boss can't drive 55, but he can drive back and forth across the screen. Same difference, right? That said, Venture Kid is a terrific old school game that, while lacking an innovative identity, possesses tried and true action-platforming gameplay. The difficulty might spike in the endgame, but all in all, Venture Kid deserves a place on every Mega Man fan's home screen, as it is insanely affordable, oodles of fun, and has tight and satisfying controls. After February's first review, Rayman Adventures, SuperPhillip Central takes a look at another platforming icon, Sonic the Hedgehog. Here, I check out the Blue Blur's next mobile outing, Sonic Runners. I just hope I can keep up! Sonic the Hedgehog has seen multiple releases already on mobile devices with games like Sonic Dash and Sonic Jump. With his latest mobile offering, he gets a game designed by Sonic Team itself instead of a Western developer. However, the end result, Sonic Runners, may have compelling gameplay, but it has a free-to-play model so sinister that it would make even Dr. Eggman shake his head in disgust. It seemed like the obvious type of game for Sonic the Hedgehog of all characters to inhabit, the runner. 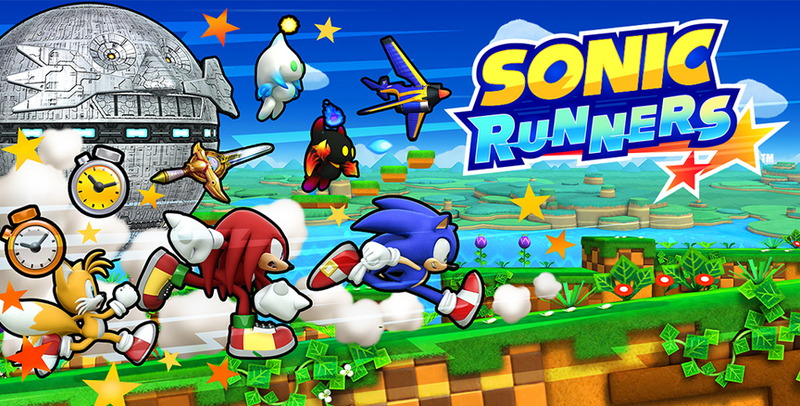 However, Sonic Runners is hardly just another runner game. 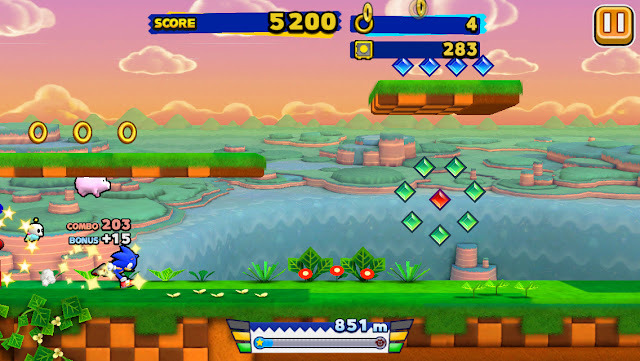 It has multiple levels to it that show off areas from Sonic: Lost World, such as the Green Hill equivalent of Windy Hill, Desert Ruins, Sky Road, and even Dr. Eggman's stomping grounds in the game, Lava Mountain. There's an insane amount of text for a game of this type through Sonic Runners' story, and all of it is unneeded and superfluous. I ended up just skipping the dialogue entirely, as there are only so many scenarios that can be set up that have Dr. Eggman doing evil hijinks for the umpteenth time. The runner genre seems perfectly fitting for Sonic the Hedgehog, and it mostly is. Regardless, the actual gameplay is a lot of fun and designed well. It's just like what you'd expect a Sonic-starring runner to be like. You move from left to right in an automatic fashion, tapping the screen to jump and doing so again while in midair to perform a second leap-- a double jump, if you will. The round ends when you fall into a pit or take damage without holding any rings, typical Sonic the Hedgehog stuff. These Egg Pawns are no match for Sonic's speed. Levels are similar to the old 2D Sonic games, possessing multiple tier design to them. The greatest amount of rings and gems rest at the top of the screen and makes for less of a worry about colliding into a wall, a pit of spikes, or just a pit in general. 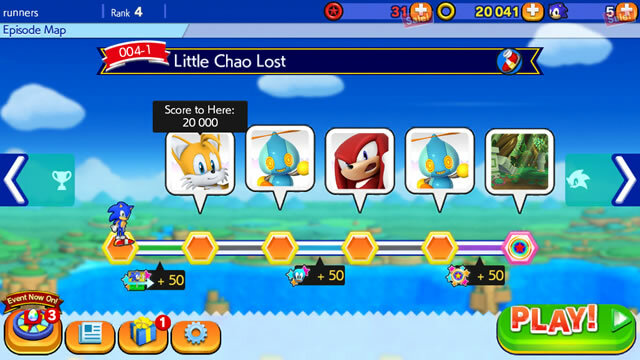 Collecting rings and gems one after the other in a short amount of time gives you a combo bonus, and your score at the end of a run determines how much advance through a chapter of Sonic Runners' story. 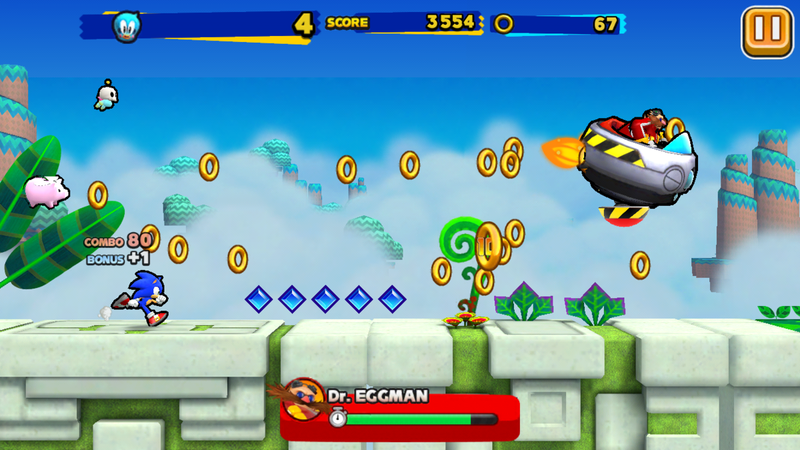 Get a high amount of points, and you'll quickly pass the requirements to face Dr. Eggman in a one-on-one battle that when beaten, opens up the next chapter for play. Earn enough points in a run to make your way to a given chapter's conclusion. 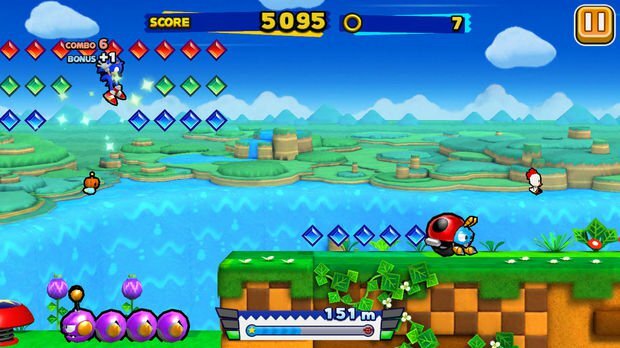 The potential for long-term playing is there for Sonic Runners. Each of the over a dozen characters have their own gauges to earn experience with. Earning levels provides a given character with bonuses, such as more invincibility time from invincibility item boxes, for instance. You can also earn and equip what the game calls "Buddies", which give each character different bonuses during play. These take the form of series regular since Sonic Adventure, Chaos, as well as other objects and shapes. A hit to Dr. Eggman will let loose a whole lot of precious rings. Like I said, there's potential for long-term play, but whether or not it's actually worth it is an entirely different story. This is because Sega and Sonic Team went the wrong direction with the microtransactions and free-to-play style of the game. This all begins with dying once in a given run. You are given a chance to return to your run by either spending a certain amount of Red Rings or through watching a 30-second advertisement. This isn't counting the ads that you have to watch after runs that pop up occasionally. Throw that in with long and frequent load times, and you're already getting your chops busted enough. However, that wasn't enough for Sega or Sonic Team. You get two different roulette wheels to spin, one of which you get a free spin on a daily basis. The thing of it is that this wheel is pretty much full of useless stuff that you wouldn't want to spend your time with. The actual roulette wheel that has worthwhile goodies on it (such as new eggs to hatch new Buddies, or new characters to unlock) requires 50 Red Rings to spin. This would be great if Red Rings came naturally at a fast enough pace to feel you were investing your time in a positive way. Levels start out slow enough, but every now and then the speed increases. Thus, Sonic Runners is a good designed gameplay experience that is trapped behind walls upon walls of sleazy microtransactions and is a slave to the free-to-play model. It's the type of game that is a perfect example to unfortunately bring up to show how not to make a mobile game that respects the player and doesn't treat them so obviously as a money-generator. Otherwise, Sonic Runners is an enjoyable runner, when you actually get the chance to play it without all the loading times, ads, notifications, and microtransactions. After an atypical Friday edition, SuperPhillip Central's Favorite VGMs probably didn't give you enough time to miss them. Still, they're back on this Monday evening for your listening pleasure. This week's edition is all PlayStation, all the time with five VGM volumes regarding PlayStation exclusive games. 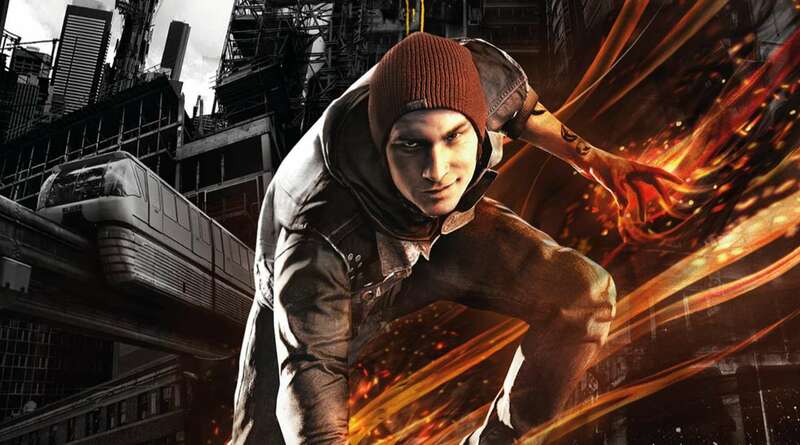 We start out with some realism with Infamous: Second Son and God of War: Ascension. Then we end on a cartoon-y angle with music from Ratchet & Clank: Up Your Arsenal, LocoRoco 2, and Puppeteer. It's a mix of music from PlayStation platforms that should satisfy any want. If you want to listen to any VGM volume previously spotlighted on SuperPhillip Central, look no further than the VGM Database. We begin this PlayStation installment of SuperPhillip Central's Favorite VGMs with a series that hasn't been on the Favorite VGMs... until now. It's Infamous, and the game we're listening to a song from is the PlayStation 4's Second Son. While not the greatest the Infamous series or even Sucker Punch have to offer, the game was beautiful to behold and a blast to play. What's your opinion on the God of War franchise? Have you seen enough of Kratos and wish that Sony would take a different route with a new protagonist, or do you think Kratos is too iconic of a game character to replace? 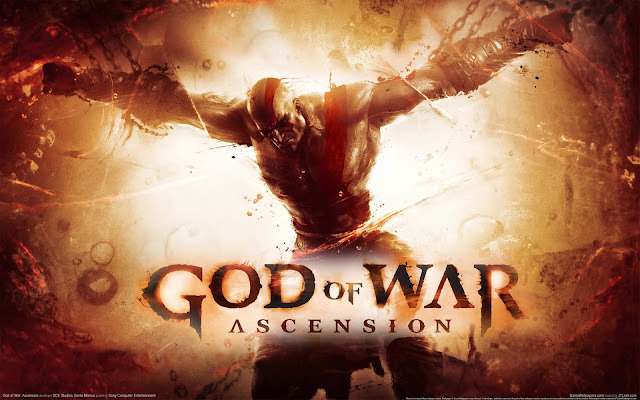 Whatever the case, you can bet with God of War you'll get a sensational and epic score, and that is no better exemplified than with Warrior's Truth from God of War: Ascension. Ratchet's home planet is the beginning to his adventure in the third Ratchet & Clank installment, Up Your Arsenal. 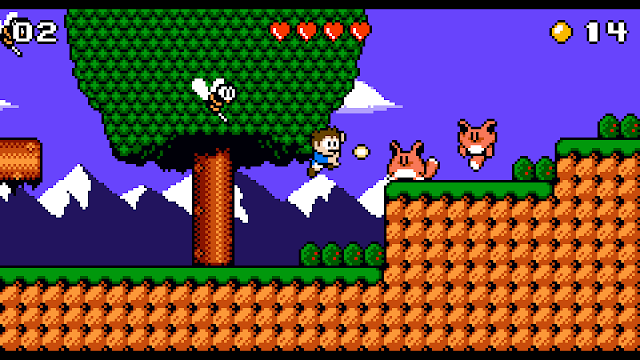 The game had a more action-oriented tone to it, though it still possessed plenty of platforming charm for players to enjoy. 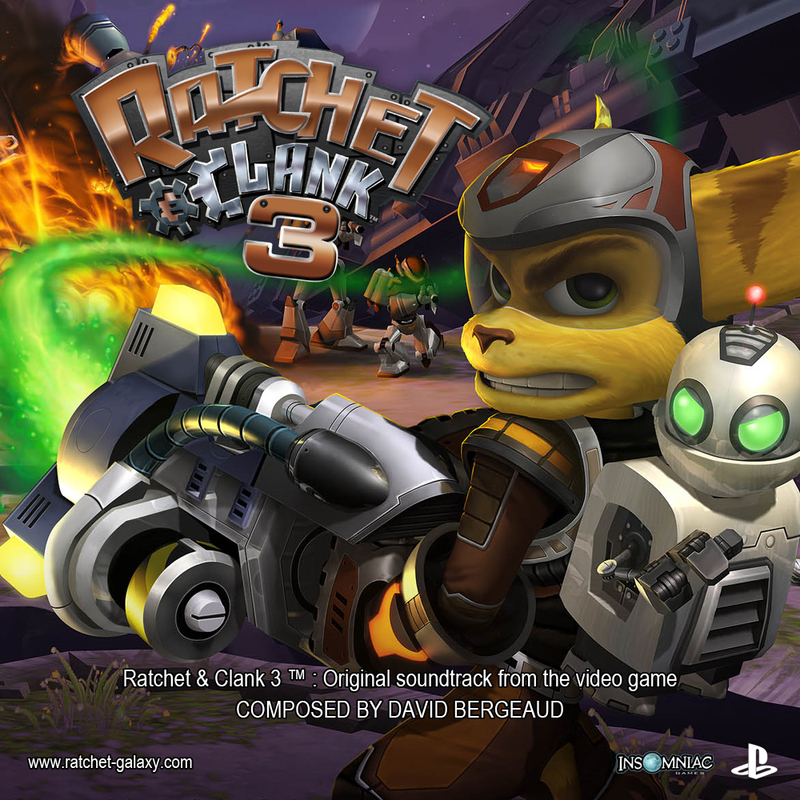 David Bergeaud was the composer behind many early Ratchet & Clank soundtracks, and it's my honest opinion that the series' soundtracks didn't reach the same height as the earlier Bergeaud-composed scores. 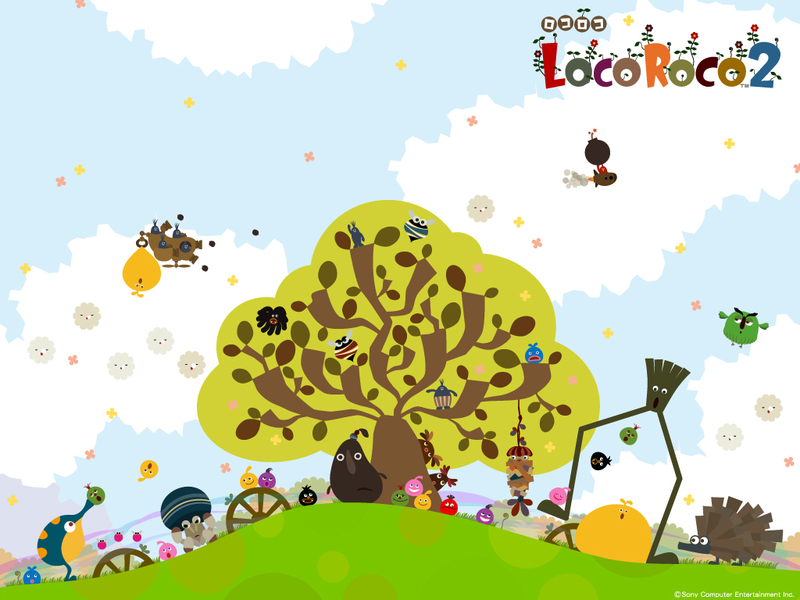 Time to get goofy with this eccentric credits theme by the LocoRoco All-Stars. Whether they belong to the orange, green, red, blue, black, or whatever colored LocoRoco family, this song is a perfect wrap-up to the pure platforming goodness of LocoRoco's sequel. v1075. 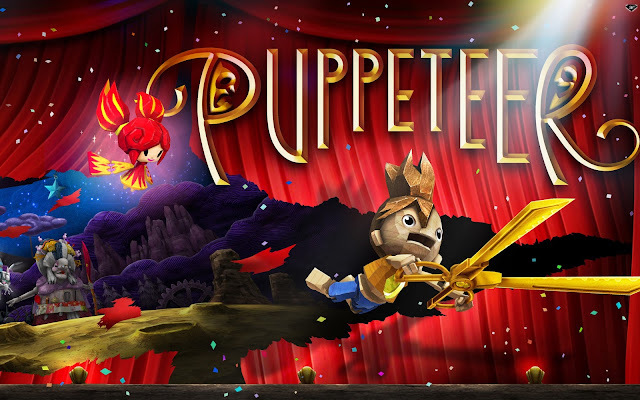 Puppeteer (PS3) - Fire the Long Toms! Ahoy there, mateys! This final song for this PlayStation-centric edition of SuperPhillip Central's Favorite VGMs comes from Puppeteer, a game that didn't get its fair shake, as it released around the PlayStation 4's launch. Still, if you can mind the constant interruptions to gameplay via the charming story, you'll most likely dig this 2.5D platformer.